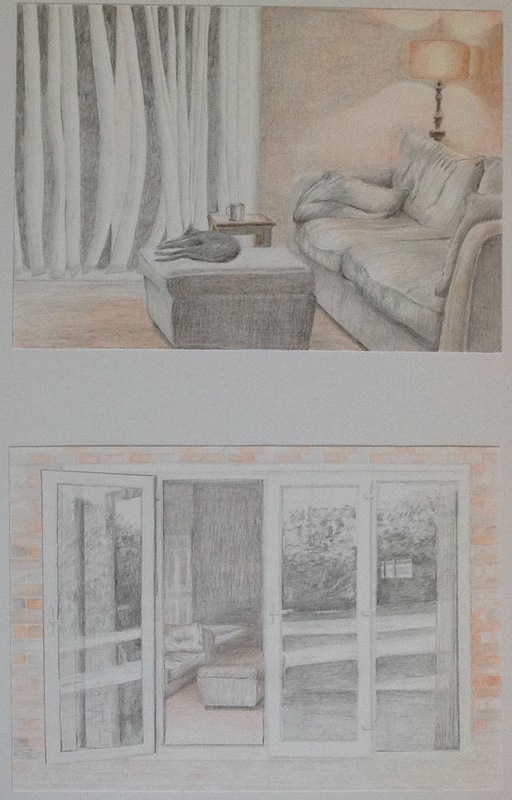 Thinking about both these points I decided to work on two further A 4 drawings to accompany the A 3 pencil drawing of the lounge to see how the different perspectives and compositions of the same subject, added to the narrative. I like how these suggest a movement of time and changing of view from inside looking out to outside looking in. I think they could have worked better if they were all the same size and I used the same colour range. After receiving my report I had a further conversation with my tutor. We had an interesting talk about size and how I could think about drawing with different extremes. How would one of my portraits look if enlarged further ? What impact would a more detailed drawing of an interior have if drawn on a postcard size support framed on an A1 sheet. What demands would it make on the viewer? These are all considerations I will take with me on the next stage of my drawing journey. For assignment 1, I chose to make a few drawings of the same group of personal objects. I feel I was able to demonstrate my technical skills when working with chalk and pencils, however although less accurate, the ink and pen and brush drawing, have made for a more expressive and personal drawing. I need to work on reaching a balance between a colder, more technically accurate drawing and a looser more expressive one. Using mirrors also gave opportunities for multiple viewpoints and I would like to explore working with reflections further. Again technically this drawing of fruit and bowl is accurate but my one of pears is a more interesting composition. The apples and grapes is a safe and traditional arrangement and maybe a little boring. I have tried to experiment with mixed media and achieving a depth of colour which I feel I have achieved but the choice of media hasn’t allowed for the waxy texture of the apples or the luminosity of the grapes. Maybe water colour pencils or partial washes would have worked here. In hindsight, I should have spent longer practicing different compositions and different ideas before committing to this piece and this might have given me the confidence to try something bolder. As suggested by my tutor, I could have tried different objects as seen in Lucien Freud’s ‘Still life with Aloe’. 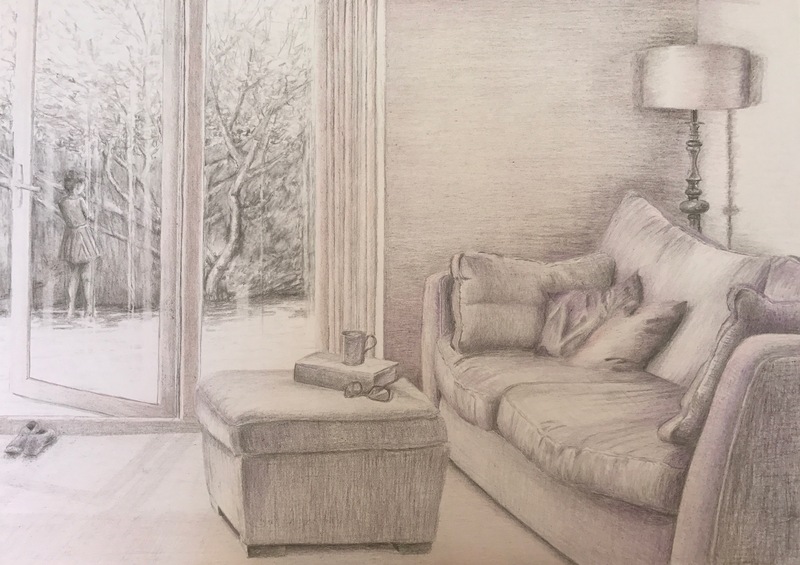 I also want to take forward ideas from my sketches on interiors, particularly the rocking chair composition where there are mini still life’s within a drawing and how they can create interest and a hidden narrative. This time I did experiment with different views, compositions and drawing media before committing to my final piece. I feel my observational skills are improving with regards to perspective and that I have created an interesting composition. The thick charcoal stick and A1 support have encouraged me to be freer and more experimental in my mark making, such as erasure technique. The washing line gives a sense of human presence and therefore some narrative and interest for the viewer but otherwise the drawing is just of a scene. This is something I want to explore further in future drawings…what to put in and what to take out. 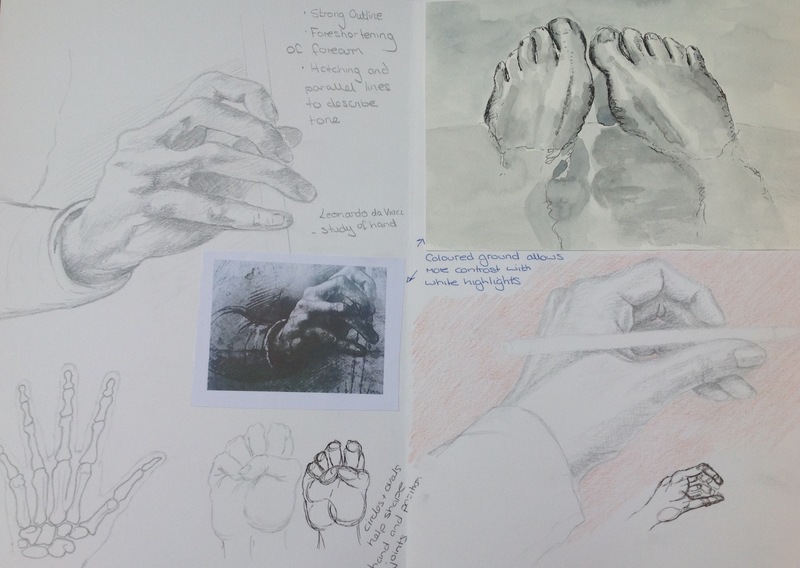 I am pleased with my observational skills overall and feel I have achieved the correct proportions and foreshortening skills in my assignments. Figure reclining in tone – after discussion with my tutor I realise that I didn’t choose the best colour for a support for my chalk drawing and that a more neutral colour could have acted better as a mid tone and have given me better alternatives than red as a darker tone. Also the drawing looks lost against the strong blue. Seated figure in line- Working on A1 requires a larger tool as the pen required a lot of work. I could try a brush or felt pen and try to use my whole body to make larger more expressive marks. Having said that, I really enjoyed working on this drawing and like the different patterns and textures of different fabrics. Portrait- This drawing has more expressive marks but the background needs to be darker to accentuate the lighter tones and thereby creating more drama. Of the artists I researched for this assignment, many of the figures and portraits were seen out of an environment or background scene. Similarly my drawings have little in the way of context the person being central. The figure in line maybe has some narrative in that he is dressed for the office and is working on his gadgets but if I had also placed him in an environment it would have made for a more interesting drawing. Summary of Video tutorial: we discussed areas to go for in part 5 – a more personally driven project approach. You wanted to continue working with the figure, and experiment with a greater variety of supports and drawing media and instruments as additional objective. I suggested you write up a proposal for now which you can email me, this will then get reworked into your project statement later on when you had a chance to revise your ideas. There are (optional) possibilities to implement close to home aspects to the figure, by including furniture, interiors or other domestic ‘stage settings’ for the figure. 2. A laboured finish – freeing up gesture? 3. Use of supports (low quality papers can limit the results especially if working with wet and dry media) Although on a budget investing into some better papers would yield better results, especially if working with fugitive media (pastel/charcoal) to allow better integration of pigment into surface of paper. With wet media like ink again the potential to explore washes for immediate tone would be better explored in heavier papers with a watercolour finish. We discussed Bristol Card and Senellier cartridge 300gms weight as inexpensive alternatives to Hot Press heavy grade watercolour paper. The nature of this part of the course leads to quite self-conscious results in many students, and as in previous assignments, the sense of having to finalise and conclude all what has been learned in the assignment can lead to a lack of freshness, or spontaneity and lack of risk taking. • Landscape and perspective work was strong in sketchbook: you offered unusual perspectives and beautiful integration of clouds/ weather with rooftop drawings; your townscape drawings in sketchbook in particular where often very atmospheric. • Portrait work in part 4 through less predictable formats out in part 4 and could form part of your project approach for part 5? This I found difficult as I have enjoyed all parts of this course so I am thinking of combining the ‘figure and face’ with ‘your immediate environment’. I have looked back at some of my sketches around the house and they lack a sense of narrative. Also my figures from part 4 are very much the centre focus and are not placed within an environment. As previously mentioned I would like to explore reflections further and am thinking along the lines of an intimate bedroom scene with use of mirrors to add different perspectives and views. I would also like to think about the figure as part of the scene rather than being central to it. 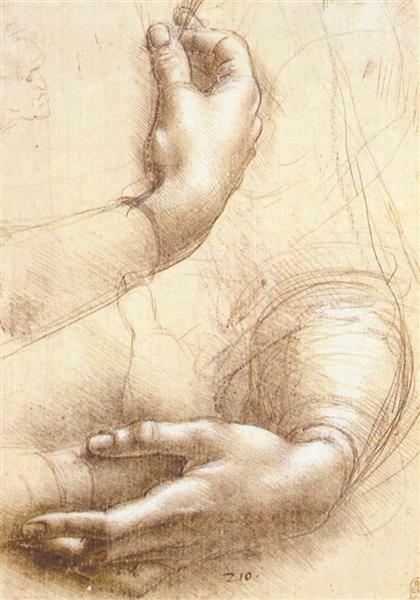 As this is an area I have been struggling with I have been having a practice at hands and feet while also looking at the work of Leonardo du Vinci. 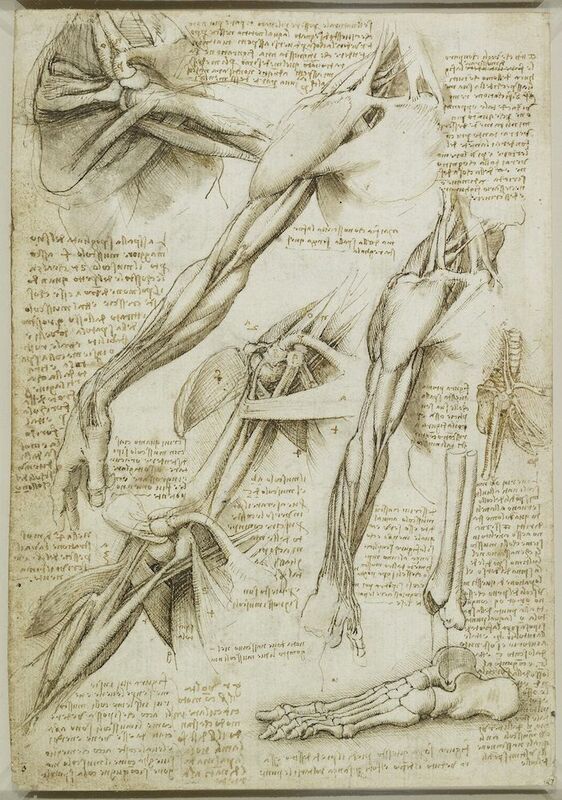 He looked closely at the anatomy of the body to better understand it’s structure. The skin acting like a cloth over the body hiding the underlying structures of muscle and skeleton. Here I have also tried to think about using circles and cylinders to build up my drawings but I am not sure if this helps. In the sketch of my feet in the bath I have been experimenting with the use of a coloured ground to emphasise the white highlights. I think this works well. 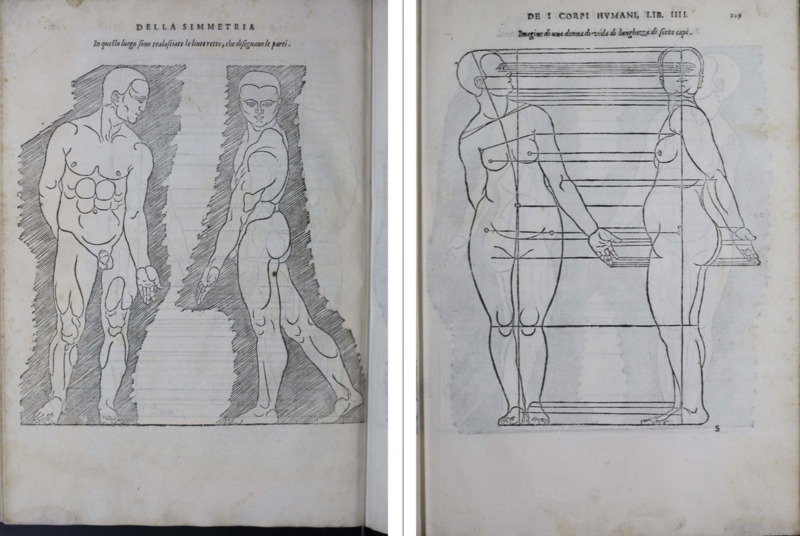 Albrecht Durer(1471-1528), studied in order to portray the human form accurately through proportional measurement. 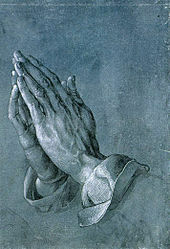 The pen and ink drawing , Praying Hands (1508), are beautifully drawn and show a close observation.